On the night of February 1, 1945, Ensign John M. Roe, age 22, took off from Charlestown Auxiliary Naval Air Station in Charlestown, Rhode Island, for a night training flight. 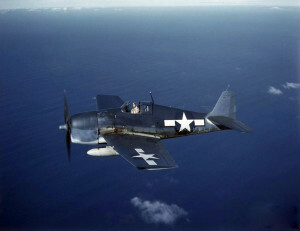 He was piloting an F6F-3N Hellcat, (Bu. No. 41144). On the same night, Ensign Robert L. Herren, age 23, also left Charlestown on a night training flight in an F6F-3N Hellcat, (Bu. No. 42776). It is unknown if both aircraft were part of the same training flight. About 25 miles off Nantucket Light, two aircraft were seen by ships in the area to crash in the ocean, but in different proximity to each other. Search and rescue operations were instituted, but neither aircraft nor the pilots were recovered. There is a memorial erected to Ensign Roe at the New Weston Cemetery, in Weston, Ohio. See www.findagrave.com, memorial #121796478. Ensign Roe and Ensign Herren are also listed on the memorial at the former Charlestown Aux. NAS, today known as Ninigret Park.